I'm beginning this wrap up of our celebration of Women's History Month with a reminder for all of you to enter our giveaway of 30 People Who Changed the World: Fascinating Bite-Sized Essays from Award-Winning Writers (Seagrass Press), edited by Jean Reynolds, if you haven't already done so. Carla announced the giveaway on Monday, when she posted a terrific interview with Jean Reynolds. But Carla was too modest to mention that her essay, "Radium Girls," is included in the book, which is why we chose to offer this giveaway in conjunction with Women's History Month. In the essay, subtitled "The Taste of Death," Carla shares the sad story of how female factory workers contracted radiation poisoning from painting watch dials with radium so that they'd glow in the dark. Maybe in a future post Carla will share what led to her writing this essay. My guess is, it may be connected to her research for her acclaimed nonfiction book Something Out of Nothing: Marie Curie and Radium. Esther's Women's History Month post included a great list of resources on the topic. 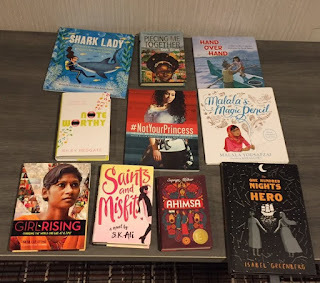 I'd like to add one more: a Nerdy Book Club post by Kate Hannigan listing 31 New Picture Book Biographies to Celebrate Women's History Month as part of the #31Women31Books campaign. Kate is also featuring an interview on her blog with Heather Lang, author of one of the 31 biographies as well as books about other notable women of history. You can read that interview here. And don't forget about the Playing by Heart "Book Bag and Swag" giveaway I'm hosting for Women's History Month. You'll find all the details on this page of my website, along with a link to where you can download a free PDF excerpt of Playing by Heart. Don't delay. The giveaway ends tomorrow, March 31! Be sure to check out this week's Poetry Friday Roundup hosted by Heidi Mordhorst at My Juicy Little Universe. 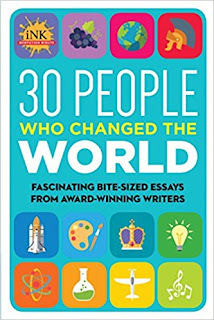 Fascinating Bite-Sized Essays from Award-Winning Writers. for this book are at the end of this post. It is my privilege to introduce you to our guest today. Jean E. Reynolds co-founded The Millbrook Press in 1989, where she served as Executive VP and Publisher. She developed Millbrook’s trade imprint, Roaring Brook Press, winner of two Caldecott awards. Before founding Millbrook, she had been Editor-in-Chief of Young People’s Publications at Grolier and Editor in Chief of The Book of Knowledge and, prior to that, Senior Vice President / Editorial Director and a member of the Board of Franklin Watts, Inc.
Now retired, more or less, she edits a blog called The Nonfiction Minute consisting of daily postings of 400-word essays by 30 award-winning nonfiction writers for young readers. She has edited two books based on this blog, 30 People Who Changed the World, and 30 Animals That Share Our World. In the spirit of full disclosure, I’ve come to know Jean as an editor recently because I’m part of the group of authors that make up iNK Think Tank, who produce The Nonfiction Minute. 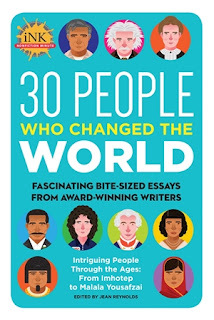 Also, one of my essays appear in 30 People Who Changed the World. Congratulations on the book you edited, 30 People Who Changed the World, which was selected as a Notable Social Studies Trade Books for Young People 2018 by the NCSS-CBC Notable Social Studies Committee. Can you tell us how this book came to be? Vicki Cobb first started iNK Think Tank in 2009 when the Common Core Standards had just been implemented, requiring more reading of nonfiction. A number of her fellow nonfiction writers were pleased that the importance of their genre was being recognized by the education community. But they also knew that most teachers had very little awareness of the trove of excellent nonfiction books related to their required curricula and that those books were actually sitting idly on their school library shelves. Vicki approached a number of her favorite award-wining nonfiction authors and convinced them to join with her in creating a database aligning their books to the new Standards. They created a website, which launched under the domain name of www.inkthinktank.com (now www.inkthinktank.org) in October 2009. All 22 member-authors donated money to make it happen. These authors used their combined strength to purchase electronic equipment and learn how to do two way virtual classroom visits. But as they got to know each other, they all realized that they wanted to do something more to introduce fine nonfiction writing to the classroom. Thus the idea of The Nonfiction Minute was born. And this is the point where I was brought into the organization. I was a newly-retired editor who had worked with many of the iNK Think Tank authors over the years. I know it’s hard to believe that a group of authors voluntarily called in an editor, because as a group we do tend to create a lot of work for a good author – but that’s what they did! The plan was for each member of the iNK group, which had grown to more than 30 at this point, to create multiple 400-word nonfiction essays with the intention of posting one each day for use in the classroom. It was my job to organize the effort, sometimes suggest the topics, edit the articles, illustrate the articles with free materials, solicit and edit an mp3 of the author reading his/her essay, and prepare a description of the author’s latest book to be included at the end of the essay. The first year, academic 2015-16, was a gargantuan effort for all of us in that we were all in unfamiliar territory. I had to learn how to work not only as an editor but as a fact checker and copyeditor – the latter being the most difficult. I had had a staff of copyeditors overseeing my work for decades, and it was very difficult to not only edit but copyedit the essays. Fortunately I was working with authors who were the best of the best in the field, but I literally wore out my Chicago Manual of Style. I was worried that without the power of a major publishing house who was going to pay an author on the completion of the work, there were no carrots to keep the very busy volunteer authors on track. But to my delight, I discovered that their carrot was not money at all, but rather their true belief in what we were giving to children. How is this book different from other books on the market today? 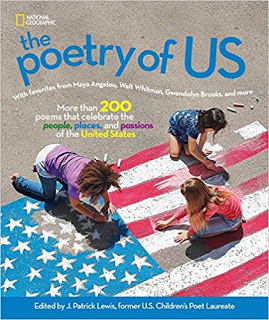 There may be other anthologies in the children’s book market – although the only ones that occur to me now are poetry collections in which different poets are paid by the piece to be included in a single volume. But I don’t believe that anything else exists that is based on the premise of good nonfiction writing. I think such a volume would be very difficult to put together because the selection would be so subjective. Also, the expense of paying for 30 essays would be major. Remember that all of our authors are doing this without payment, which makes this book possible. One of the many unique things about 30 People is that each of the 30 biographical essays is done with a different style and different approach. It was an interesting experience for me as an editor transformed into an author to work with our very excellent copyeditor at Seagrass. Coping with the work of 30 different authors was a real challenge for a copyeditor whose job is to assure uniformity of style -- and it was kind of fun for me as the author-once-children’s-book-editor to have to argue on behalf on inconsistency! 30 People Who Changed the World is interesting especially since it is a compilation of articles by different authors. Can you tell us how it works to edit this type of book? Josalyn Moran, the Seagrass publisher who discovered The Nonfiction Minute online chose the topic. She felt that introductions to new subjects or new details about old subjects would be helpful to upper elementary and middle school students who were involved in the inevitable assignment “Write an x-hundred word biography of a person you admire.” Our Nonfiction Minutes fill that bill beautifully. So for me, who was familiar with all of the Minutes, it was a question of picking 30 out of the 60 or so biographical Minutes. I wanted to use not only all different approaches by different authors, but also a wide variety of subjects balanced between the well-known and the virtually unknown. I wanted people from different eras, which we definitely achieved by including Imhotep of 2600 BCE and present-day Malala Yousafzai! Also we wanted a balance between male and female, and of course, racial diversity. By the time these factors were all considered, the choices were pretty obvious. Because the Minutes had been published previously and were still available for free on line, I wanted to add some additional factors and the logical thing to do was to help kids who were interested in knowing more to get started on their research by adding a Find Out More section to each Minute. So I went back to the authors (who had already done a great deal of in-depth research on their respective biographees) and asked them to give me the title of the best book on their subject, the URL of the best introductory website, and the link to an interesting U-tube, all of which were then included at the end of each Minute. As the book came together, I was very happy that I had been such a strict taskmaster about the length of the minutes. As you know, I was adamant about the 400 word limit, and that helped the design flow very smoothly because our wonderful designer Marc Cheshire could perform his magic on the total layout even before he had the final text, knowing in advance how much room to allow for each minute. I’m afraid that many of my free illustrations which worked well on a computer screen were not high enough resolution to work in a book. So we had a lot of scrambling to find additional art. It was wonderful to have professional researchers at the publisher working on it rather than me. Like my copyediting knowledge, my picture research is rusty. I’ve been working with and selecting pictures for years, but always with lots of help from professional researchers. Also, the publisher gave us a generous budget for pictures, whereas my budget for the illustrations for the online Minutes was zero. One problem was that the author’s book promotion could not be placed at the end of each Minute as it was on line. I felt that information about each author was a must. I lobbied hard for eight full book pages for author bios, photos, and book mentions. We even included the author’s home town and email addresses. 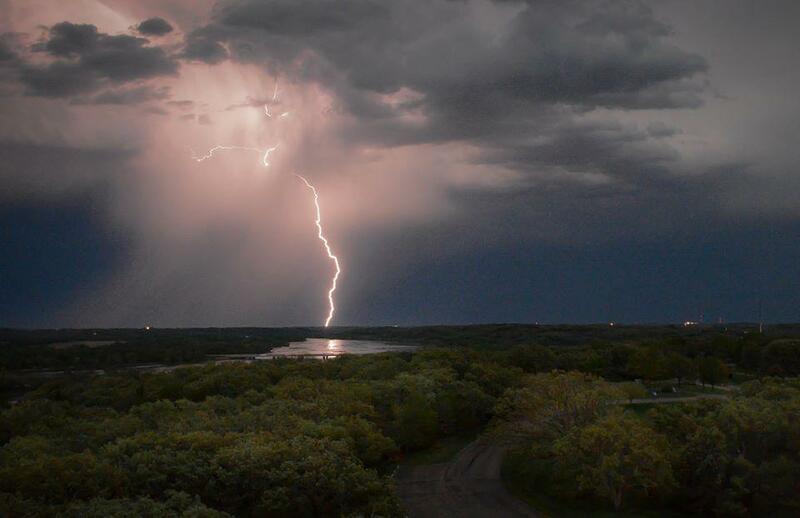 I had to keep making suggestions about what photos we could cut, or even text we could cut to keep that eight-page section in tact – but it remained. I felt that the volunteer authors needed some sort of major recognition in the book, not only for providing the one or two Minutes contained in the book, but for the scores of other Minutes they have produced over the past few years. So all in all, editing this book and working with a publisher as an author rather than being the publisher myself was a really interesting experience. Because she knew my extensive background, I think the editor, Josalyn, probably included me in a lot more decisions that the average author might have been able to participate in. We consulted on the title and subtitle and cover design and cover copy – actually publishing details that I knew a lot more about than being an author. It was fun. One final thought on the topic. Reading this book from an editor’s standpoint, can you give our readers some advice on writing captivating nonfiction? I think captivating is the operative word in that question. I think in order to captivate your reader, your topic has to have captivated you. In that case, you do the best you can to share your enthusiasm. Many years ago, I read an article that really helped form my love for what is called narrative nonfiction. (Narrative nonfiction means that the author is really telling an interesting story and not presenting a series of facts and figures about the subject.) The article, which probably was in an educational magazine, quoted two articles on the VietNam war. The first was from a well-known American history text book, and I remember it began: “Vietnam is a Southeast Asian country on the South China Sea.” In the course of about 300 words it described the location and climate of VietNam, the years the war lasted, a bit about why the US was a combatant country. I think the article lost me on the opening sentence. The second article was from Time Magazine and it began with two American soldiers lying under some jungle foliage with artillery fire from the North Vietnamese passing just over their heads. They had me! I went on to read the rest of the dramatic story of what brought these Americans to this point, and the subsequent story, I learned a lot about VietNam. In a widespread educational test, the text book article was given to a large group of students and the Time article was given to a different group. Both were tested on the information two weeks later. The textbook group remembered very very little, while the Time group could repeat parts of the story and actually remembered facts about VietNam and the course of the war. Our aim in the Minutes is to have our writers tell an interesting enough story that our readers may mention something about it later on the playground, or talk about it at home over dinner. Of course there are many other things about writing good nonfiction, but none are more important than captivating your reader. 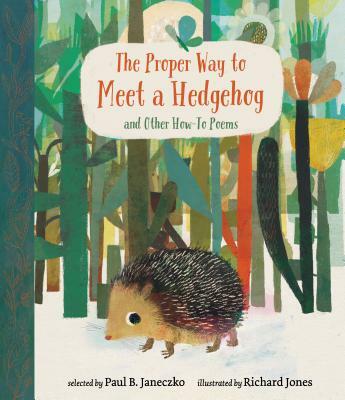 Do you have some suggestions about how teachers could use this book in the classroom? I am not a teacher. That’s a very hard job, and I don’t think that I’d be very good at it. But I do spend a lot of time talking with teachers about how they work with kids and books. As I mentioned earlier, 30 People is a great resource if there are students having trouble finding a topic for a biographical essay. Also, I understand that some teachers are using the individual Minutes for (shudder) test prep. We have added a new Transfer to Teaching section for each minute published this season which has a custom page with creative ideas for using the Minute in the classroom. Organized by subject area and focused on critical thinking and problem-solving skills, these ideas have been created and organized by certified school librarian Karen Sterling, an iNK Think Tank member. Each Minute is also categorized according to the Library of Congress Subject Authority headings to increase access points for users. So my suggestion would be for a teacher interested in specific ideas for any of the minutes in the book, use the archives on the NonfictionMinute.org website to find any of the Minutes in the book and click on the T2T link. Are there more books like this one in the future? Absolutely. 30 Animals Who Share Our World is being released by Seagrass on April 4, 2018. This book has some fascinating science, as well as some delightful stories about animal behavior. This one has a huge variety of minutes ranging from a poetry collection in praise of vultures to the commuting habits of a British cat. You’ll learn a lot, but this one is really fun! We’re talking about a future STEM-themed book, but it is not yet under contract. written by iNK Think Tank and edited by Jean Reynolds, use the Rafflecopter widget below. You may enter via 1, 2, or all 3 options. Note: if you submit your comments via email or Facebook, YOU MUST STILL ENTER THE DRAWING VIA THE WIDGET BELOW. The giveaway ends April 6, 2018 and is open to U.S. residents only. As a child, I had lots of female heroes. They lived in the biography section of the library. Amelia Earhart, Clara Barton, Jane Addams. These women were daring and brave, breaking the female norms of their day. They had something else in common. By the time I was born, they were all long dead. I didn't realize as a pre-teen in 1960's Mississippi that I lived within fifty miles of a woman who would become one of my adult heroes. When I did school visits in connection with Yankee Girl, it was a twenty minutes of Civil Rights history. Lynchings, bombings, segregation, and of course, the Ku Klux Klan. After all that, the first question during Q & A was always, "Weren't there any good white Mississippians? Did anyone stand up for the black people?" The first time I was asked, I hemmed and hawed and said I was sure there were, but I couldn't think of any. I explained how dangerous it was for white people to take a stand. People kept their "different" views to themselves. By the next school visit, I had thought of someone. Yes, I did know a good and brave white woman (Alabamian by birth, but who lived in Mississippi). 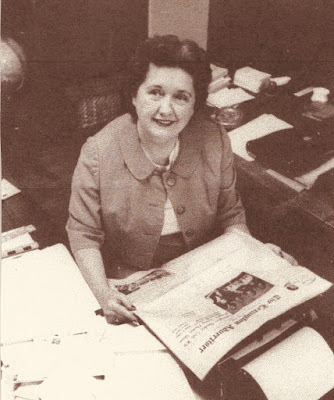 Her name was Hazel Brannon Smith, a woman who was a journalist (a female journalist! ), publisher, owner and editor of four small newspapers, mostly in Holmes County, Mississippi. In 1964, she also became the first woman to win the Pulitzer Prize for Editorial Writing. I first heard of her through the four-page weekly, The Northside Reporter, my parents subscribed to. Each week there was an editorial column called "Through Hazel Eyes" written by Hazel Brannon Smith. I had never encountered a female journalist who wasn't a "society writer," relegated to what used to be called "The Women's Section": weddings, engagements, debutant balls, soirees and "ladies' club "meetings. This Hazel lady wrote about important things--like rights for black people, voter's rights, police brutality. She felt the same way about these events that my parents did: horrified. It was as if I had found a new friend. Up until then, I thought we were the only white family in Mississippi who thought these things were wrong. Now, I had Hazel! I later learned that Hazel Brannon Smith owned The Northside Reporter.. The Reporter's office was fire bombed by the KKK in 1964. Even at 10 I knew about the Pulitzer (after all, I planned to win one myself some day!) I was so happy when my friend Hazel, won it for "Through Hazel Eyes." First female winner for editorials. Big stuff! Big news! But as Paul Harvey (a favorite in my neck of the Mississippi woods) used to say "And now the rest of the story." Because Hazel was becoming all unhinged and dishonoring her "southern heritage," the White Citizens Council in her hometown decided to teach her a lesson. (The Citizens Council was a more upscale version of the KKK. Council members were white collar, professional men of the community---former Senate Majority Leader Trent Lott was a member.) The WCC began publishing their own newspaper to compete with Hazel"s. Within two years, Hazel's paper was in financial trouble as her advertisers defected to the Citizen's Council paper. Then, as a final flourish, the WCC engineered the firing of Hazel's husband from his job as county hospital administrator. Friends in the civil rights community took up a collection to keep Hazel's paper going. She limped along until she was awarded the Pulitzer for "steadfast adherence to her editorial duty in the face of great pressure and opposition." Winning the Pulitzer only enflamed the Citizens Council more. They organized a boycott of Hazel's few remaining advertisers AND her subscribers. She had no choice. One by one, she sold off her papers. Within twenty years of winning the greatest prize in American journalism, Hazel was no longer a newspaper woman. With time on her hands, she helped out with The Jackson Advocate, the weekly for Jackson's African-American community. It was a volunteer job that involved driving 100 miles, round trip, several times a week. Hazel Brannon Smith died in 1994, at the age of 80. She had no survivors. And I am left with a mystery. How did a woman, raised in segregated Alabama ("The Heart of Dixie" is still part of the state's license plates), a sorority girl at the University of Alabama, seemingly the average career woman of her place and time...how did she transform into a Civil Rights crusader? As of this month, there are only two biographies of this amazing woman. Many people who consider themselves scholars of the Movement have never heard of her. going to let that freedom slip away by default. I wish she were here and writing today. 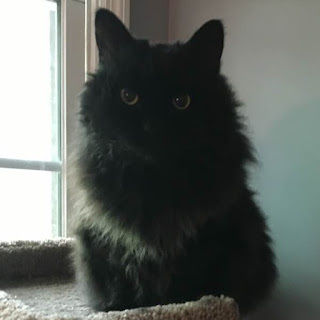 As you may remember, I have a cat named Comma. This week, Comma fell seriously ill. He is on the mend, but taking care of him is quite labor-intensive at the moment. As a result, I have not had the chance to write my entry for our current exploration into Women's History. Please accept my apologies. This is one of my favorite topics, and I love this series. I encourage you to visit our Women's History Month extravaganza. MARJORY STONEMAN DOUGLAS ~an activist wow! The link to PF and my rough draft poems are below, along with a Poetry Challenge to you. I really want to read what you've written! Now it's time to leap into our Women's History Month extravaganza. 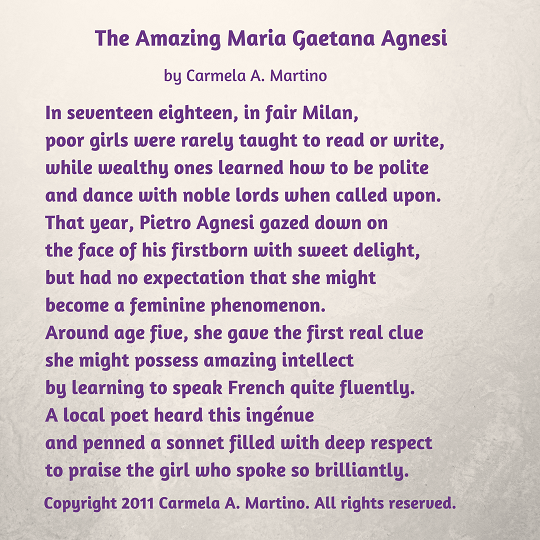 First is Carmela's Women's History Month Sonnet (the first she's ever written! ), then Esther offers an explosion of resources on women's history as well as a top ten books list about powerful, creative women. What woman in history could I write a poem about? My subject was hiding in plain sight. 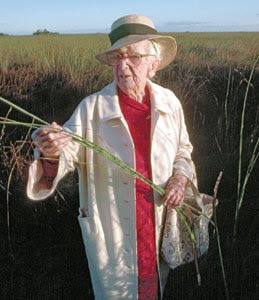 Marjory Stoneman Douglas was an environmentalist, author, journalist, feminist, civil rights defender for whom the now-famous Parkland, Florida high school was named. Born in 1890, Marjory changed the state of Florida. Her book "The Everglades: River of Grass was published in 1947 and sold out of its first printing in a month. The book's first line, 'There are no other Everglades in the world', has been called the 'most famous passage ever written about the Everglades'...It "galvanized people...[and] has been compared to Rachel Carson's 1962 exposé of the harmful effects of DDT, Silent Spring; both books are 'groundbreaking calls to action that made citizens and politicians take notice' [and]'remains the definitive reference on the plight of the Florida Everglades.'" "Mrs. Douglas was half the size of her fellow speakers [5'2”, 100 lbs] and she wore huge dark glasses, which along with the huge floppy hat made her look like Scarlett O'Hara as played by Igor Stravinsky"
"At the age of 79...Douglas founded Friends of the Everglades to protest the construction of a jetport in the Big Cypress portion of the Everglades. She justified her involvement saying, 'It is a woman's business to be interested in the environment. It's an extended form of housekeeping.'" What a tireless, funny, cunning, strong-willed woman! Of course there should be a high school named after her! Here are rough drafts of two poems about her. The first I wrote before I had read very much about her. The second was written after I had read more and was zinging with excitement. But I was also overwhelmed; there was too much wrap my arms around! I have new respect for those of you who unwrap layers of history to make it concise, exciting, lyrical and accessible. How do you non-fiction writers DO it?!?! I don't have much distance from either poem...which works best for you? Can't you boo any louder? Don't you just know Marjory would be proud of the students who are stepping up and speaking out? Here's my challenge to you, dear Readers: read the Wikipedia article (and/or other sources) and write your own poem about her...then share it in our comments. I really want to read what you come up with! PS: Consider joining KidLit Marches for Kids on March 24th. Here's the Publishers Weekly article about this organization. And thank you for hosting PF on TeacherDance, Linda! It’s Women’s History Month! Book It! There are a gazillion different ways to celebrate the vital role women have played in America’s history. Participating institutions sponsoring events, programs and exhibits include The Library of Congress, the National Archives and Records Administration, the National Endowment for the Humanities, the National Gallery of Art, the National Park Service, the Smithsonian Institute and the United States Holocaust Memorial Museum. Given our readership, however, I say: just book it, especially with an Amelia Bloomer List award-winning children’s book! The annual List is a project of the Feminist Task Force of the Social Responsibilities Round Table of the American Library Association. Titles include both fiction and nonfiction for early, middle grade and young adult readers. Here are the Top Ten Amelia Bloom List winners for 2018. Books are selected each January and must have been published in the U.S. in the previous 18 months. 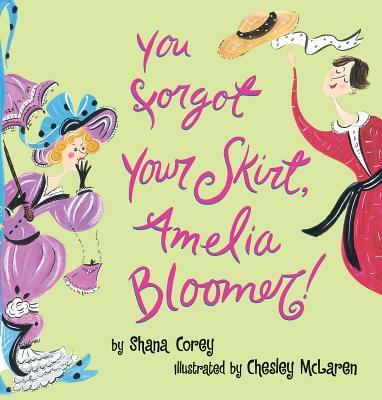 Amelia Bloomer, in case you didn’t know, was a singular feminist pioneer, a nonconformist and modern rebel who lent her name to a daring 19th century garment when she popularized in her newspaper The Lily the baggy gathered pants worn beneath a woman’s knee-length skirt - i.e. bloomers! Amelia believed writing was the best way for women to work for reform. The Lily was the first newspaper for women, issued from 1849 until 1853 and published in Seneca Falls, NY. It began as a home distribution journal for members of the Seneca Falls Ladies Temperance Society. FYI: The Lily has undergone a 2017 revival! Facebook, Instagram, Twitter and www.TheLily.com are all viable connection options. 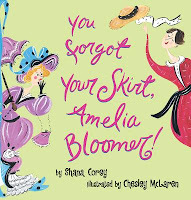 Shana Corey’s picture book biography YOU FORGOT YOUR SKIRT, AMELIA BLOOMER (Scholastic Press) does one swell job telling Amelia’s important story to young readers. Speaking of telling important stories of important women to young readers, meet three Chicago-area children’s book authors who did just that. Suzanne Slade, author of DANGEROUS JANE (Peachtree), Barb Rosenstock, author of DOROTHEA'S EYES (Calkins Creek), and Kate Hannigan, author of A LADY HAS THE FLOOR (Calkins Creek). This trio of award-winning picture book biographers celebrated Women’s History Month this past Wednesday, March 7 at 57th Street Books in Hyde Park. It was SRO and deservedly so. In honor of Women's History Month and Poetry Friday, today I'm sharing an original sonnet about a little-known woman of history. You'll find my poem at the end of this post. 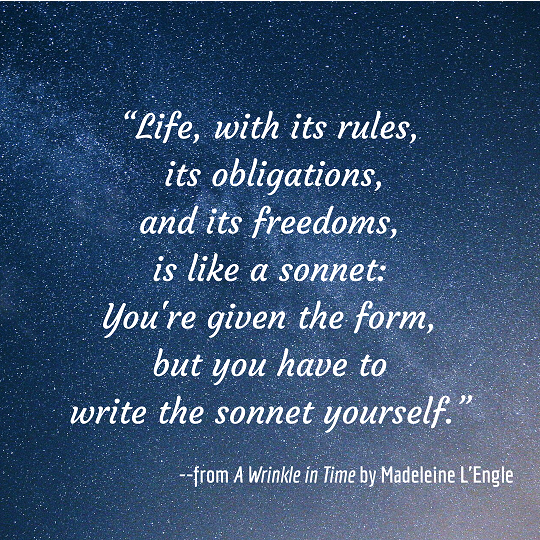 Today happens to also be the official release date of the movie adaptation of Madeleine L'Engle's classic novel, A Wrinkle in Time. Yesterday, for International Women's Day, a number of people Tweeted about their favorite female authors as part of #IWD2018. 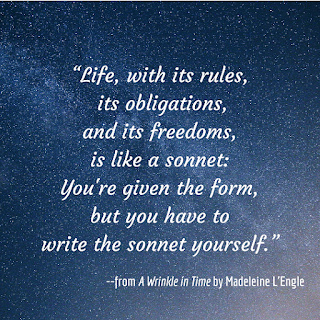 Well, Madeleine L'Engle is one of my favorite authors period, male or female. Our Not for Kids Only Book Club reread A Wrinkle in Time for our March book and we'll be going to see the movie this weekend. While I'm disappointed that the early reviews aren't very positive, I'm still looking forward to the outing. I hadn't read the book in years, yet some of the scenes were still quite vivid in my memory. I'd completely forgotten other parts, though, and I'm curious to see how the story has been interpreted for the film. Instead of tweeting about authors, yesterday I shared an image honoring the two amazing sisters who inspired my YA novel, Playing by Heart. 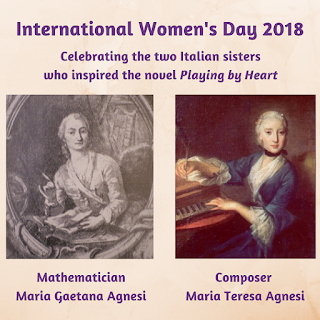 As I've shared here before, Playing by Heart grew out of my research for a nonfiction biography of Italian linguist and mathematician Maria Gaetana Agnesi. Even though I have an undergraduate degree in Mathematics and Computer Science, I never heard of Agnesi until I came across her name in an article about little-known women of history. I wrote the biography, in part, because I found her life fascinating, but also because there are so many myths about her, both in print and online. I still hope to find a publisher for that biography. Meanwhile, I have created a website to dispel some of the myths. Yesterday, for International Women's Day, I posted the above image there, along with some credible references for those who'd like to know the truth of Maria Gaetana's story. I also shared that I'm currently offering a special Playing by Heart "Book Bag and Swag" giveaway for Women's History Month. I invite all our TeachingAuthors readers to enter the giveaway. 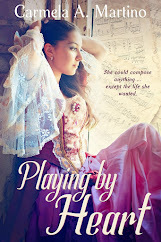 You'll find all the details on this page of my website, along with a link to where you can download a free PDF excerpt of Playing by Heart. 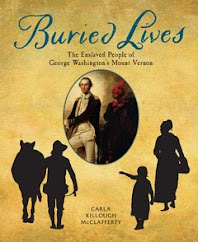 Later this month, Carla will announce a special Women's History Month book giveaway here on our TeachingAuthors blog. Be sure to watch for that! I mentioned above that I'd be sharing an original sonnet today--the first I ever wrote. 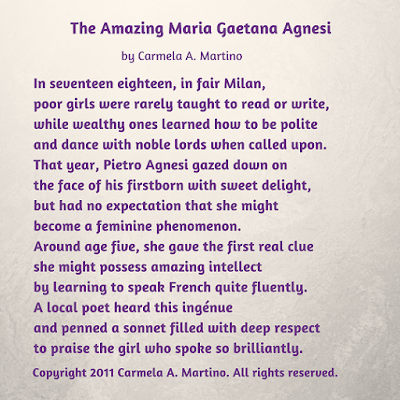 I was inspired by a sonnet published as a tribute to Maria Gaetana Agnesi when she was only five years old. That sonnet, written in Italian, praised how “marvelously” she spoke her first foreign language, French. (Maria Gaetana mastered seven languages by the time she was a teen.) Since I couldn't translate the original sonnet without losing its form, I wrote my own, which you can read below. My sonnet, like the one published in 1723, follows the pattern found in “Italian" sonnets. They have a “turn” or change in thought that is signaled by a change in the rhyme pattern. I hope you can spot the “turn” in my poem. 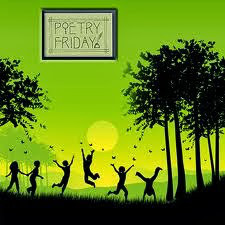 Be sure to check out this month's Poetry Friday roundup hosted by Michelle at Today's Little Ditty. I provide interactive videoconferences for schools all over the country. My programs are listed and available to request on the web site for the Center for Interactive Learning and Collaboration (CILC). I do a variety of programs; one of my favorites is teaching a class of students how to brainstorm. First I explain that in my session-and in brainstorming-there are no wrong answers. I assure them that when they brainstorm for their own ideas it is quick, painless and best of all, no one will see their ideas or grade their brainstorming session. It is only for them and will help THEM. And I really mean it. Brainstorming is a prewriting skill that with minimal effort produces maximum results. In these sessions I model brainstorming and lead them along with me. The way I teach brainstorming is to tell them to jot down things you know about the topic AND things you don’t know—in the form of questions. You don’t have to know the answers to the questions. Sometimes it is the questions from a brainstorming session that gives you the angle of your research paper. The key is to just let thoughts about the topic develop naturally and let one thought go to the next. The first few thoughts on any topics are usually about the basic things that everyone knows. The “good stuff” and by that I mean unique ideas- are never those first few ideas. The best ideas are the fifth or sixth or later ideas that you consider once you think a little longer about the topic. As my session continues, I get them to participate in on the spot brainstorming. Soon they start giving suggestions. I remind them there are no wrong answers or silly answers-it is all just loose thoughts. No pressure. Once they get the hang of that, we move on. We brainstorm again and this time I ask them to give me some ideas on possible angles for a research paper. They can do it. In less than an hour, many of these students seem to really grasp the benefits of brainstorming. The feedback I get from teachers for the session make me think that for some of these students, they have a good grasp on a brainstorming as a useful tool in their prewriting toolbox.